It’s absolutely true what they say, when a child is choking they make no noise at all…and all they do is look at you, desperation in their water-filled eyes while they silently gasp for air. Gagging is not choking, coughing is not choking, spitting up is not choking! Right now I am thanking our lucky stars that both M and I knew what to do only because we’d seen a couple of youtube videos and some hand-outs from our BVC. It got me thinking though, what is the advice in Sweden on infant and child first aid, and where do you go if you need help? 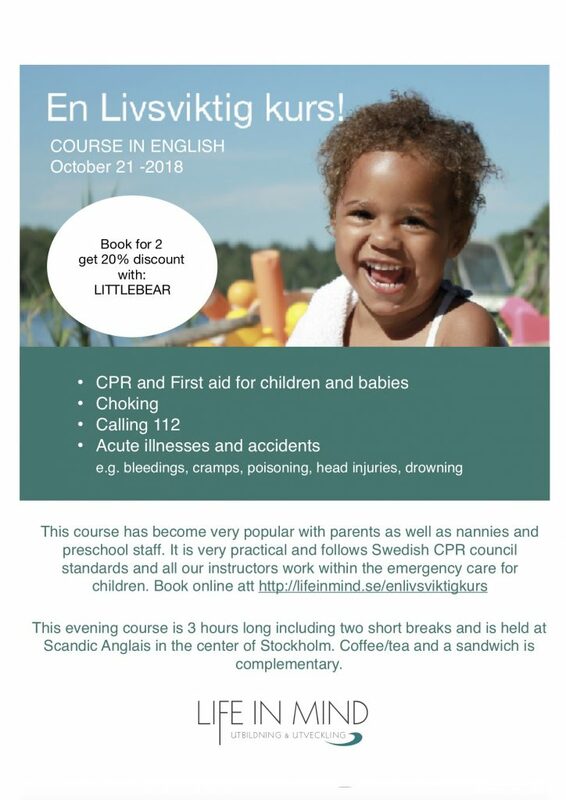 If you want prepare yourself in the best possible way, Life in Mind, the number 1 HLR/CPR and emergency first aid training course in Stockholm is offering Littlebearabroad readers the chance to take part in an English-speaking HLR course on 21st October. You’ve also got the chance to get 20% off if you book two spots on the training course using the special ‘Littlebear’ user code.